This recipe takes pasta salad to a big flavor level. It's great to make ahead and serve for a simple luncheon. Cut Canadian bacon into thin strips. In a large bowl combine bacon, zucchini, red pepper and Parmesan cheese; set aside. For dressing, combine oil, vinegar, garlic, Italian seasoning, sugar, salt and pepper. Pour dressing over bacon mixture; toss gently to mix. Cover and chill 30 minutes. Cook conchiglioni according to package directions. Drain and rinse with cold water. Spoon about 1/4 cup of the bacon mixture into each conchiglioni. 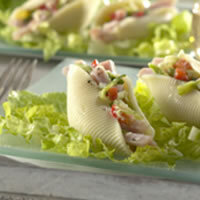 Place the shells, filled side up, in a baking dish. Cover and chill 2-4 hours. To serve, arrange romaine among salad plates. Place 2 shells atop each. Serving Suggestion: Serve with fresh seasonal fruit.